Do you remember the Birthday Cake of the Month card? The last cake I posted was from November 2010 when I announced I was pregnant and starting a new job. I can hardly believe that was over a year ago. I only had two cakes left to go and sadly, that December and January were a little hectic and the cakes were never made. So this year, I dug the card back out and made the first of the last two cakes: Peppermint Candy Cake. And in true Found Recipe Box fashion, it ended up being the perfect recipe for the situation. Last December, all through the month, I kept thinking that I needed to make the birthday cake of the month. 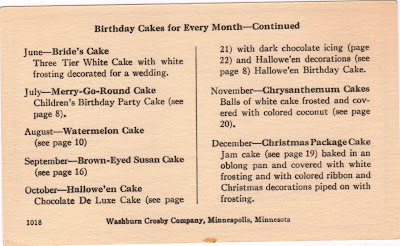 I remember checking the card and seeing “Christmas Package Cake” in black type. In my mind, I thought of all the fun ways I could decorate the cake, all of the different adornments I could add to make it a truly tempting package to tear into. But December came and went and the cake was never made. At various times throughout the past year, it would pop back into my mind. “In December,” I thought to myself, “I get to decorate a cake to look like a beautiful present!” And again the list of colors and bows and fancy gift tags would float around in my mind. I thought back to the Queen of Hearts Cake and the Merry-Go-Round Cake and made a mental list of ways I could incorporate different artistic styles. Finally, December arrived. 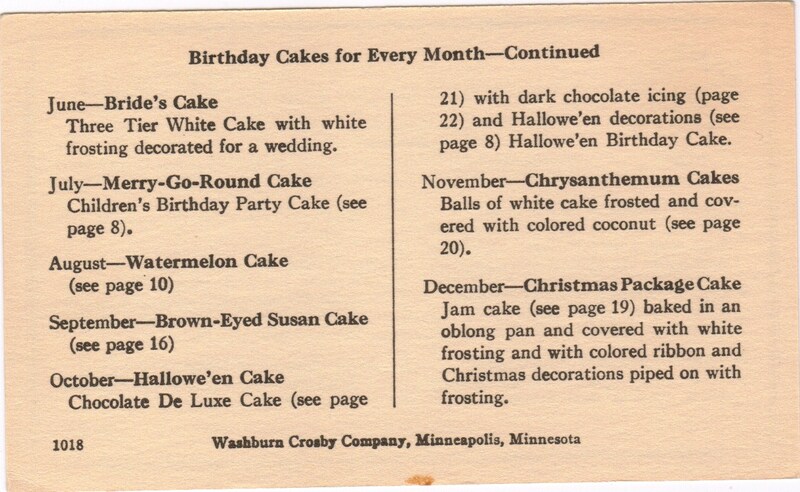 I pulled out the card, grabbed the New Party Cakes for All Occasions booklet, turned to page 19 and…it wasn’t there. The cake inside the package was supposed to be a jam cake. I flipped though each page of the booklet, but never came across the jam cake. I looked again, read each recipe title carefully. Nothing. So I flipped back to page 19 and was treated to a nice surprise. 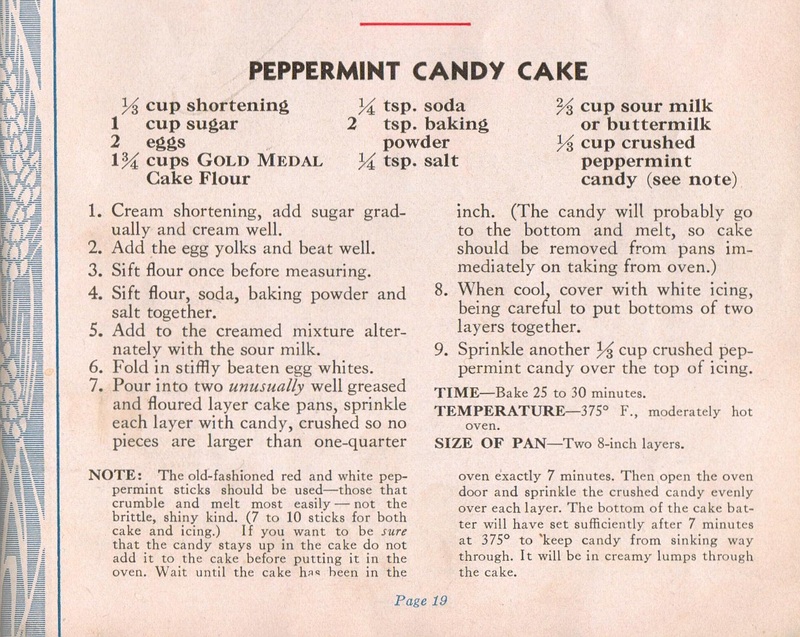 Instead of a jam cake, there was something much more delicious and appropriate for the holiday season in its place: a Peppermint Candy Cake. While I was crushing up candy canes to sprinkle into the batter, I kept thinking of the Chocolate Roll Cake and my mom’s variation, which will always be an absolute favorite of mine. She put crushed peppermints into the whipped cream center of the cake, giving it just a hint of Christmas flavor and a slight crunch with each bite. Lucy watched as I slowly turned the red and white canes into small chunks and powder. I wonder, when she’s older, what recipes will remind her of me. Sadly, I don’t think it will be this one. Once the cake was completed and decorated, we dug in for our first taste. Immediately I noticed the consistency. It wasn’t the soft, moist bite I was expecting. Instead it was dense and a little crumbly. I’ve been told that the ratios of ingredients on some of these older recipes need to be adjusted a bit. Perhaps if I play around with it, I can soften the cake up (here’s another example of chemistry coming back to haunt me!). Because with just a little more moisture and maybe a few extra candy cane pieces thrown in, this just might be a cake that Lucy would remember well into her adulthood. And it fit perfectly with the lesson I’ve been reminded of again and again the past few years. Sometimes we hit bumps in the road, whether it is something as major as unemployment or as simple as a recipe missing from the page or a dry cake. Regardless, we just need to stay focused, make a few adjustments and move forward. 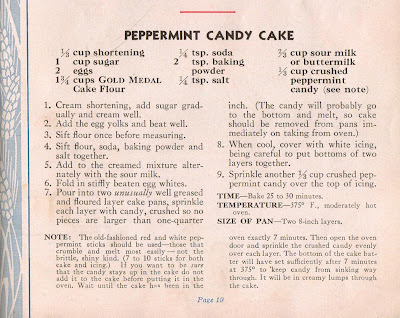 Of course, typing those words out are much easier than applying them to real life sometimes, but when the prize for all that hard work is a delicious piece of Peppermint Candy Cake, it makes the tough road ahead a little easier to follow. If anyone has any suggestions on how to moisten the cake or adjust the ratios of the ingredients, let me know!